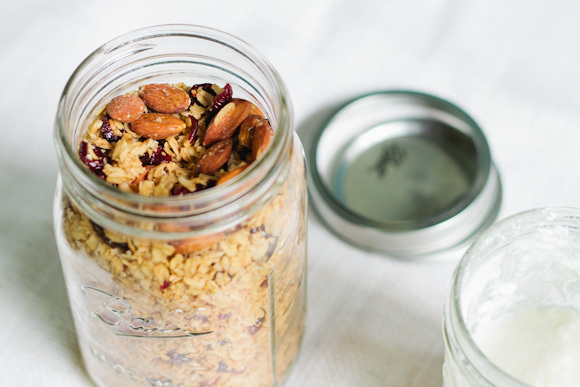 This is by far the best and easiest homemade granola recipe I have ever made. Its inspired by a recipe I came across a few years ago in Yankee Magazine. The ingredients are simple enough that I almost always have them on hand in my pantry to bake up a batch of granola. Its great on its own, or with milk or yogurt. In fact, I've recently started making my own homemade yogurt! Its magical. I found a great yogurt tutorial online, I'll share that below as well. 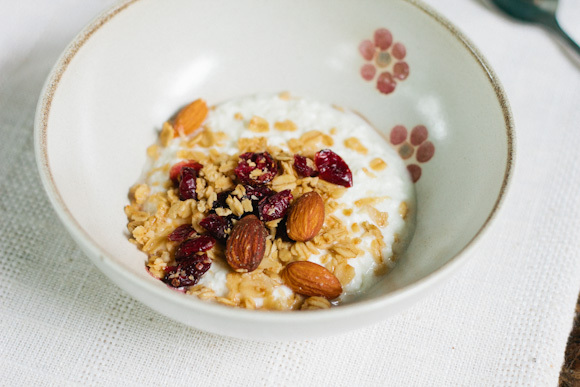 Preheat oven to 250 degrees F. In a large bowl, combine oats, almonds, coconut and sea salt. Add maple syrup and safflower oil and stir until all dry ingredients are evenly coated. Spread out on one large, or two small baking sheets. Bake for 45 minutes, stirring every 15 minutes for even browning. Remove the baking sheets from oven and let cool completely. Scoop granola into large bowl. Add the cranberries and mix well. Store in well sealed bags or large mason jars. Lasts about two weeks. *Watch out for coconut and dried cranberries which are sweetened with lots of sugar. Go for unsweetened coconut whenever possible. Look for cranberries which have been sweetened with fruit juice rather than sugar. 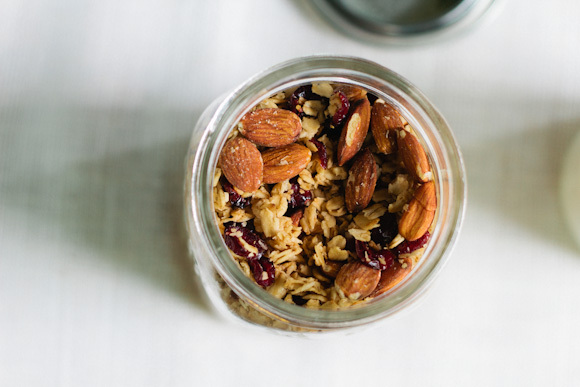 Now that you've made your own granola (it wasn't so hard!) it's time to try your hand at yogurt. 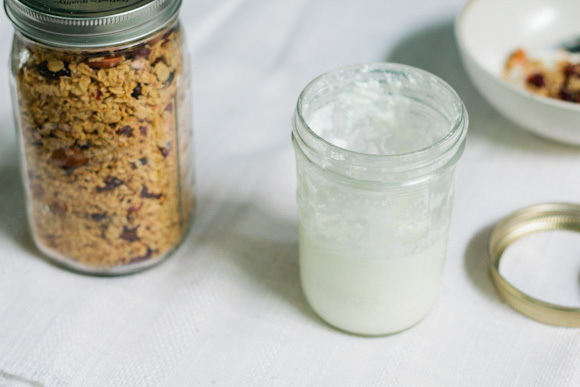 I've had the best luck with this homemade yogurt tutorial from The Kitchn. You'll need a big pot, a thermometer that hooks to the side of your pot, milk (so long as it is not ultra-pasteurized) and some yogurt to use as a starter. I always try to use whole, organic dairy products. Store bought yogurt often contains pectin to artificially create a smoother, thicker product and to extend shelf life. Your homemade yogurt might appear curdled or clumpy, and this is as it should be! Plus the taste is far superior and so much fresher than anything you buy at the supermarket. If you like it sweet, add your own honey and fruit. I keep mine in a sterilized mason jar in the fridge for up to two weeks. Save the last half cup to start your next batch! Now add it all together for your super good homemade breakfast. Yum. For another homemade breakfast recipe perfect for mornings on the go check out Blueberry Coconut Chia Pudding over on the Bliss Journal. Mmmmmm! 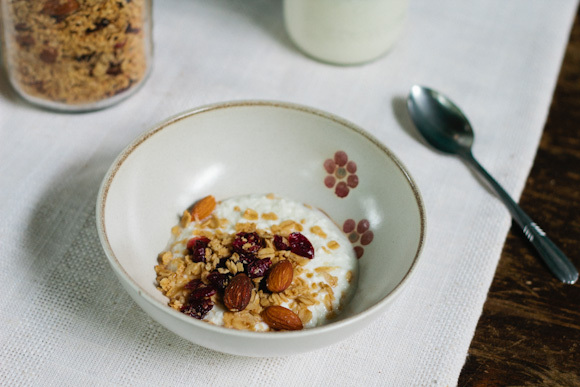 That almond granola is perfect match for that yogurt. Freshness is what sets home-made yogurt apart from store-bought ones. A serving of that yogurt will surely jump-start your day.